Archbishop Matthew Man-oso Ndagoso of Kaduna Archdiocese in Nigeria has appointed SMA Father Mark Monaghan to serve as one of his Vicars General. As VG, Fr Monaghan will be responsible for all the Religious [female and male] in the Archdiocese. For the last six years he has been VG for Pastoral Affairs. Born in Co Tyrone, Fr Monaghan was ordained in Newry Cathedral in 1969. Since then he has spent most of his priestly life ministering in Kaduna. He taught in both second and third level Colleges, particularly in Zaria. In the 1980’s he was recalled to serve as Dean of Students in the SMA House, Maynooth, Ireland. After seven years in Ireland, he returned to Kaduna and moved into fulltime pastoral ministry. Assigned to a growing suburb of the city Fr Mark was the founding priest of St Peter’s SMA parish, Sabon Tasha. After seventeen years at St Peter’s, Fr Mark moved to develop a new part of the parish, handing over to Fr Dan O’Brien SMA. St Peter’s is now under the pastoral care of Fr Ignatius Malwa SMA. For hte past ten years Fr Mark has been Parish Priest of St Simon’s, Mararaban Rido, formerly part of Sabon-Tasha. Our picture shows Fr Mark with Mrs Patricia Danmaida and her daughter, Nasara. Mrs Danmaida was educated by the Saint Louis Sisters at Zonkwa, Kaduna State. A native of Sabon Sarki, she remembers with fondness her Parish Priest when growing up – Fr Michael Kidney SMA [now working in the diocese of Cork]. Patricia was left a widow in the early 1980’s with two young daughters, Nasara and Afonu. Over the years Patricia has served on many parish and Archdiocese of Kaduna Committees. She was for many years chairperson of the Kaduna Archdiocese Pastoral Council. Currently she runs a primary and secondary school with her two daughters. The School is called Panaf (P=Patricia, AN=Nasara, AF=Afonu). This photo was taken during a visit to Fr Monaghan by Mrs Danmaida and Nasara to discuss the Archdiocesan Skills Acquisition Project for Women of which Mrs Danmaida is the chief Organiser. As well as a very active involvement in the Church, pastorally and spiritually, she has also had a distinguished career as a Commissioner and Local Government Chairperson. She has nine grandchildren. Fr Monaghan has a brother who is also an SMA missionary, Fr Danny, who is Parish Priest in St Joseph’s parish, Gowon Estate, Lagos, Nigeria. 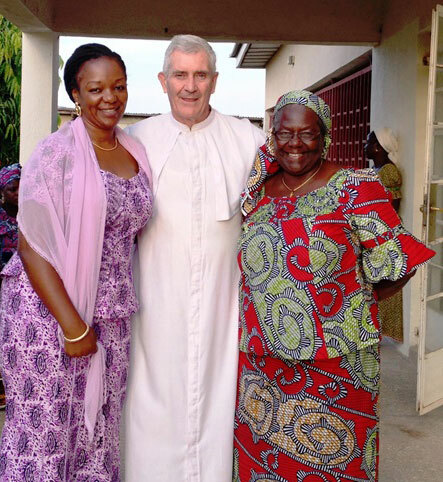 Fr Danny is in his 40th year as a priest in Nigeria. To him and Fr Mark, Ad Multos Annos!